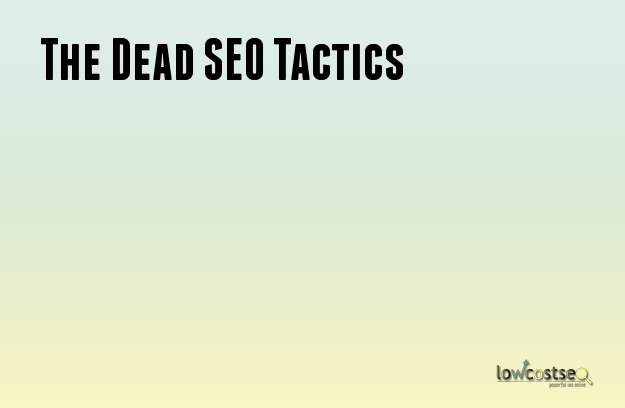 Today we will talk about SEO tactics that are dead and no longer effective for SEO campaigns. Firstly lets discuss about Keyword heavy footer links. Now it does not matter whether they're outbound or internal links, the end point is that these heavy footer links are not good at all. Lots of webmasters have learnt that the footer has been abused for a while and finally Google has done something about it. With regards to the recent updates with Google, they have changed their way on how they see the footer links and infact see more importance on the content of the site then footer. If you are using excessive keywords in the footer then you're just risking keyword demotion. Now you must be wondering what can be done? You can use the footer to somehow decrease your bounce rate. There is term used "Pogo-sticking", this is when a user clicks onto a site, then clicks back and goes to the next site. We all know that users that stick to the same site and don't click back are more satisfied with the results. Also instead of filling your footer with keyword links, try to fill more content in there to hold their interest on your website. You got to test several times to see what holds their interest and how the bounce rate is affected by their behavior. The longer the user stays on your site, the more easier it is for them to remember your site later on. They will then refer you to friends, family or share it via social media tools. The ultimate objective is to keep them on your site and not return back to Google as that might send a negative signal to them. Most of the clients that have been hit by penguin or link related penalty have had problems with site wide links. It doesn't matter if they are backlinks or internal links, having a link from every single page on any website is a bad idea more so if it'' keyword optimized. The main goal should be to get a link back to your home page from every page on your site, now that is good user interface. Now if these site-wide links are making a large part of your backlink profile then its really negative for your site and will be in trouble. So solve the above situation, try to include a few of the links in the main body while making a few recommendations at the end of each blog post. This tactic will make the users click through to see what exactly have you got to offer and kind of gets the users engaging on your site more. Now as for the external links issue, make sure you never build a site wide link at all. You should go for the contextual links. In our view, you should stay away from any unnatural linking scheme. Well its simple to explain, any link that has an intention to manipulate rankings faces a violation. Try to avoid link farms and those individuals promising you to build links quickly. Always work within the guidelines outlined by Google so that the quality levels are high and never manipulated. The main thing is DO NOT MANIPULATE with your rankings. I know SEO is a long drawn out procedure but the only way up is to work within Google's Term of Service. Its pretty simple, the web pages that send the most referral traffic are the ones that Google wants to rank on the search engines. So, in saying that, your main focus should be on promoting your site with the influencers that matter the most. If you focus on referral traffic then you end up focusing on tactics that result in natural link building. Its rather simple process, the more often people see your content, the more likely they are to link to it. The best piece of advise that we can give is to work positively and on the right path as cheating will get you nowhere.